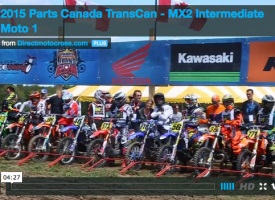 Round 2 of the Supercross Futures series took place on Sunday after A2. There was a lot of rain in the area this past week, but the track was in perfect condition for a full slate of amateur racing. It was a busy day! When I wandered into the pits to find Canadians, it looked like I was trying to find someone at the Mini O’s! It’s a great sign for the sport and someone is making bank! I thought the track was a good compromise between a very difficult Pro track and one that every age group and skill level could compete on. There were quite a few injuries, but that’s to be expected with that many races and that many people trying to learn the ropes in Supercross. Heal up, everyone that hit the ground. Here’s a look at the champions and Canadians from Angel Stadium in Anaheim, California. #79 Jett Reynolds, #199 Ryder DiFrancesco, and #71 Talon Hawkins are the future of the sport. Ryder crashed early in the race and kept looking down at the front of his bike. #38 Hayden Deegan was second to Reynolds in this Supermini 1 main. The next race was 250 B and had #53 Bjorn Viney in it. He had a good jump off the start but was down in turn 1 and headed out in last place. He worked his way up to 18th and had the speed to challenge for a podium, for sure. #146 Tyler Gibbs had a top 10 start but crashed late in the rhythm section and took 20th. #551 Mitchell Bradbury was in the 250 B LCQ and was nicely up in 4th place. He was bar to bar with another rider and crashed pretty hard entering the ling rhythm section and pushed back to last. He still finished 9th but was done for the night in that class. #325 Stilez Robertson was undefeated Sunday. I thought it was cool in staging when he told #146 Tyler Gibbs he noticed how fast he was going. That is THE Jeff “Chicken” Matiasevich on the track and winning the 40+ main. #24 Eidan Steinbrecher was the one to beat in the youngest class, 51 (4-6). #4 Jaydin Smart kept him pretty honest though. #04 Brandon Steel took the 250 C main. #43 Noah Viney was in the Supermini 2 main. He got out to 6th and finished in 7th spot. Reynolds and DiFrancesco went bar to bar in this one, just like last week, with Reynolds taking the win. #27 Vincent Wey passed his way into the 65 (7-9) lead and looked good taking the checkered flag out front. #108 Michael Carter took the 30+ win. #24 Joshua Varize is one of the most entertaining riders to watch and took the Schoolboy 1 main win ahead of Reynolds on his Supermini. #66 Casey Cochran grabbed the early lead in 85 (9-12) and had Deegan chasing him. Late in the race Hayden crashed hard and received medical attention. Hopefully, he’s doing better today. Casey took the win. #877 Ryder Ellis took the 51 (6-8) win and hit most of the big rhythms and doubles. Bjorn was back in action in the Open B main. He was 11th early and really needed a start to run the leader’s pace. He moved up to 6th by the flag. #146 Tyler Gibbs got in as an alternate in this one and won the LCQ to line up for the main. He was 10th off the start and crossed the flag there. They only take the top 2 and the Open B LCQ was only 3 laps, so a start was important. Mitchell wasn’t able to get a good one and found himself back a lot farther than he wanted. He finished 9th and headed to the stands to watch the rest of the night. Robertson took the win ahead of a distant Black and Schwartz. #100 Justin Reese took the 35+ win. #124 Tyler Floyd took Open C.
#28 Preston Boespflug took a nice win in the 85 (9-15) main ahead of Cochran. Ellis was impressive with the win in 51 (4-8). That’s a lot of air for those little wheels! Canadian #15 Dexter Seitz was in the 65 (10-11) main. He was in some good battles and took 4th place. Nobody was going to touch #180 Landon Gordon in the 65 (10-11) class. #10 Alvin Hillan crashed while running 2nd and #62 Kelana Humphrey was fast but just couldn’t stay with Landon out front. #185 Wyatt Lyonsmith took the win in the Collegeboy (16-24) main. #30 Jordan Jarvis and #34 Tayler Allred picked up where they left off in Phoenix and went at it like this for the entire Women’s main with Jarvis taking the win. #53 Viney got together with #601 off the start and got shuffled back. He worked his way up and finished 6th in Schoolboy 2. Stilez has his own thing he does over the finish line and I like it! He crushed the Schoolboy 2 class by 10 seconds at the flag. Pierce Brown seems to be able to start anywhere and take the win in the fastest amateur classes. That’s impressive! He took the win in Open A ahead of Hammaker, Harlan, and Shimoda. You’ve got to love #180 Landon Gordon’s throwback to Bob Hannah style! He took the win ahead of Hillan in the 65 (7-11) main. #19 Brandon Ray took the prize for most entertaining at round 2. He was ripping his 125 and took the win in the 125 B/C main. Noah Viney was back on the track in the last main of the event, Mini Sr.. Unfortunately, he fell in the rhythm section and was in last place. He didn’t give up and raced hard the entire time to finish 9th. #66 Casey Cochran took 2nd place. Ryder DiFrancesco took the win and crossed the flag with some calm steeze. I like that, too. The next Supercross Futures race is next Sunday, January 27th in Oakland.